As a result of the recent weather events on the east coast, Franklin Electric’s Water Systems Technical Hotline has been receiving a high number of calls concerning the use of generators with submersible installations. In order to provide an easy reference for all, it makes sense to review generator sizing here in Franklin AID. Note: The use of generators must follow all local, state, and national electrical codes. ALWAYS consult these codes before installing a generator. In addition, make sure the generator is properly ventilated and that you are familiar with its operating instructions before putting it into use. Guidelines specific to using an engine driven generator with a Franklin submersible motor can be found on page 5 of the Franklin Electric AIM (Application, Installation, and Maintenance) Manual. To determine proper sizing, refer to Table 5 on page 5 of the AIM Manual. (Click the illustration above for a close-up view. )Note that the numbers in the sizing chart apply to both 3-wire and 3-phase motors. 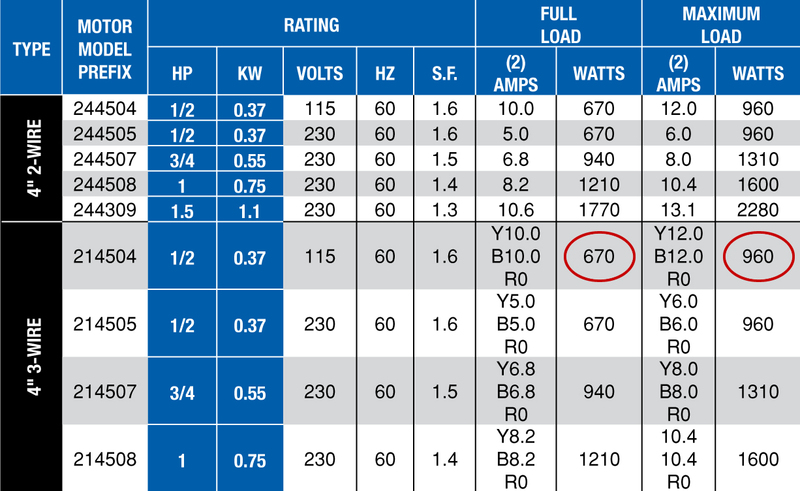 If it’s a 2-wire installation, the minimum generator sizing is 50% higher than listed in the chart. This is because of the higher starting current required for 2-wire motors. Also note that the sizing chart only applies to one submersible motor. If other devices are being powered, they must be identified along with their power consumption. Even though some of these items may not run continuously, they still need to be taken into account, per the generator manufacturer’s recommendations. The frequency of the voltage delivered by the generator will be a function of the engine’s RPM. Motor speed varies with the frequency of the output voltage, and since pump affinity laws relate power to performance, generator sizing can have significant impact on pump output. For example, if the generator is putting out a voltage at a frequency that is below 60 hertz, the pump will not meet its performance curve. Likewise, if the frequency is above 60 hertz, it may overwork the motor and trip its overloads. The generator manufacturer’s instructions will contain guidance on how to adjust the generator’s frequency. Of course, you’ll also need a voltmeter that measures frequency. Most of today’s digital voltmeters contain this function. More critically, a transfer switch also functions as a safety device to isolate the utility electrical supply from the generator. Without a transfer switch, the generator can back feed into the utility lines and, in a worst case scenario, cause serious injury or death. Unfortunately, the transfer switch is one of the more commonly overlooked safety devices required by the National Electrical Code (NEC). Code also requires that the generator be properly grounded in order to protect against electrical shock in the event of a fault. Like all electrical conductors, the ground wire must be correctly sized for the load it is designed to carry. Hopefully, you won’t find yourself in a no-power situation that necessitates using an engine-driven generator. In the event that you do, taking appropriate precautions and following this protocol will help make sure you can get your Franklin sub back online. 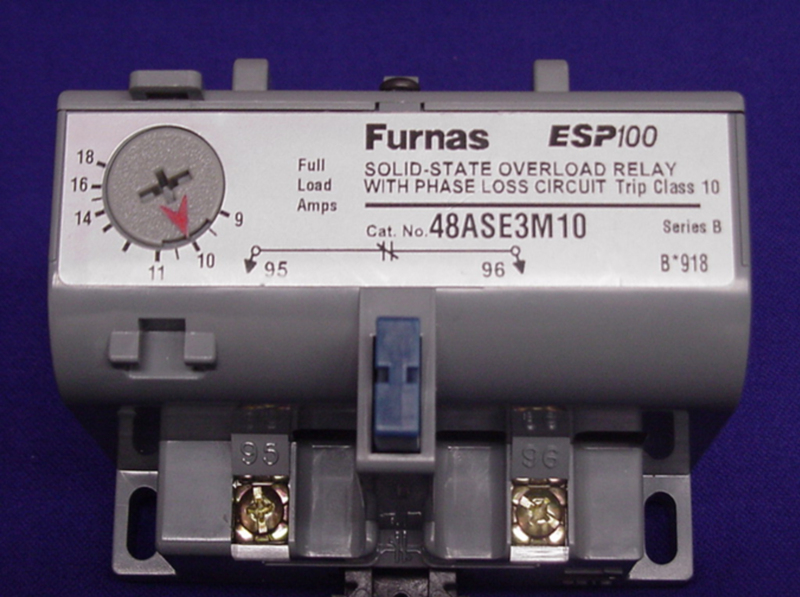 In the last post, we reviewed how SubMonitor protects a three-phase motor against high or low voltage and how the default settings of plus or minus 10% nameplate voltage provide the optimum protection in just about every installation. However, if for some reason more voltage tolerance is required, we covered how SubMonitor’s DETAILED SETUP allows the voltage trip points to be set up to plus or minus 20% of the motor’s nameplate voltage. In this post, we’ll look at how SubMonitor protects against overload and underload conditions. The classic case of an overload is a bound or dragging pump. In this scenario, the motor is being asked to do more than it has been designed to handle and must pull an excessive amount of current. This higher amperage overheats and damages the motor. At the other end, an underload can be caused by a dry well, a broken coupling, a loose impeller, or a blocked inlet. In these cases, the motor is saying, “I’m not working nearly as hard as I should be. That means I’m not moving as much water as I should be and something must be wrong.” An underload condition won’t damage the motor, but it can indicate a dry well condition which will destroy the pump. An underload condition could also indicate a lack of cooling flow past the motor. In any case, an overload or underload condition indicates that something is wrong with the installation and corrective action is needed. A reliable indication of both an overload and an underload is the amount of current the motor is consuming. 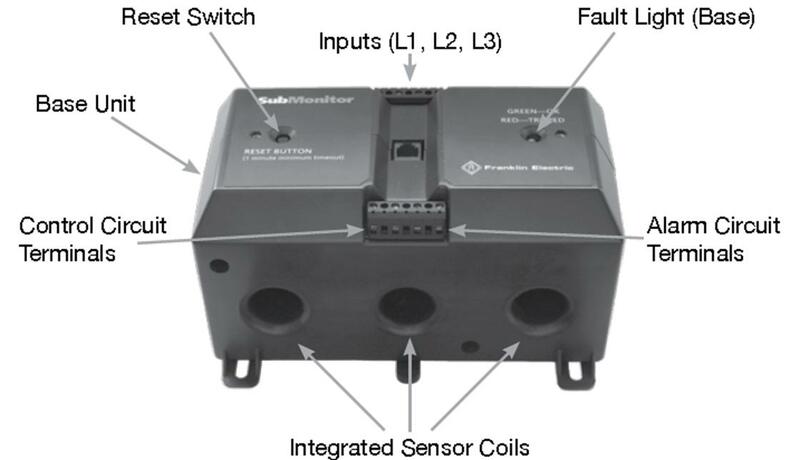 SubMonitor measures current via three current transformers built-in to the unit. These are sometimes called the sensor coils. These coils continuously measure the amount of current in each motor leg. One can almost think of the three sensor coils as three separate Amprobes, one for each leg, continuously measuring current. Using its three sensor coils, SubMonitor is always monitoring for an overload or underload condition. The default setting for an overload condition is 115% of the motor’s service factor amps. For example, from the Franklin Electric AIM Manual, a Franklin 6-inch, 460V, 40 horsepower submersible motor has service factor amps of 61.6. So, in the default mode, SubMonitor will take this motor off-line if any leg exceeds 70.8 amps (61.6 x 115% = 70.8). If this occurs, SubMonitor will leave the motor off-line for 10 minutes and then attempt a restart. SubMonitor will do this three times, but if after three attempts, the motor is still overloaded, SubMonitor will keep the motor off-line until the issue is corrected and SubMonitor is manually reset. Just like the voltage protection, the above settings can be customized using DETAILED SETUP. The overload trip point can be set from 80% to 125% of service factor amps. The off-time can be customized from the default setting of 10 minutes to anywhere between 5 and 60 minutes. The number of attempted restarts can adjusted from 0 to 10. Underload works the same way, but of course, with different numbers. The SubMonitor underload default is 75% of service factor amps. So, in the case of our motor above with service factor amps of 61.6, the underload trip point will be 46.2 amps (61.6 x 75% = 46.2). If SubMonitor senses an underload, it will leave the pump shut down for 30 minutes. In the case of a dry well, this may allow the well to recover. Once again, three restarts will be attempted before a manual reset is required. If a shorter or longer off-time is needed, it can be adjusted from 10 to 120 minutes, and the number of restarts set from 0 to 10. In terms of the underload setting itself, it can be adjusted all the down to 30% of service factor amps (less sensitive) and up to 100% of service factor amps (more sensitive). Even though SubMonitor offers a great deal of customization on the overload and underload settings, note that in nearly all cases, the default settings are the optimal settings and will do the best job of protecting the installation while minimizing false trips. SubMonitor’s overload and underload monitoring deals with the values in each leg of a three-phase motor. But there’s another current parameter here that is just as important, and that’s the balance between the three legs. We’ll look at that in the next post. In our last post, we started a series on SubMonitor. By way of a quick review, SubMonitor is one of the three types of overloads used for 3-phase submersible installations. The three types are heaters, adjustable solid state, and electronic. SubMonitor falls into the last category and although SubMonitor is classified as an electronic overload, it offers far more than simple overload protection. In the next few weeks we’ll take a look at all the capabilities and flexibility SubMonitor offers. All overloads for Franklin submersible motors must be Class 10 Quick Trip. This means they must take the motor off-line within 10 seconds of the motor reaching five times service factor amps. Overloads must also be ambient compensated, meaning they must trip consistently at the same overload value regardless of the ambient temperature. Ambient compensated overloads must always be used when the motor and the overloads are in different locations and therefore at potentially different temperatures. In the case of a submersible installation, the overloads are in the panel above ground and the motor is obviously submerged underwater. As a result, they will be at different temperatures and hence the need for ambient compensation. In our last post we touched on SubMonitor and its capabilities. Over the next several weeks, we’ll take a closer look at SubMonitor and what a critical role it can play in protecting a 3-phase installation. Before we get into the details of SubMonitor and all of its capabilities, let’s look at it in the context of overloads in general. Although SubMonitor offers far more protection than just as an overload, it functions primarily as an overload. Overloads play an important role in protecting submersible electric motors from overheating. There are two primary conditions that cause a motor to overheat and fail: a lack of cooling flow past the motor, and high current (amp) condition. While the first condition is straightforward, a high current condition may be caused by several factors including low voltage, high voltage, a ground fault, or an imbalance in a 3-phase system. Regardless of reason, power needs cut when the motor overheats. The type of protection used dictates motor survival; if you’re using the wrong overload, the motor won’t survive. Overloads for all Franklin Electric submersible motors must be Class 10, Quick Trip, meaning it must take the motor off line within 10 seconds of the motor reaching five times service factor amps. These overloads must also be ambient compensated. That is, they must trip consistently at the same value regardless of the ambient temperature. 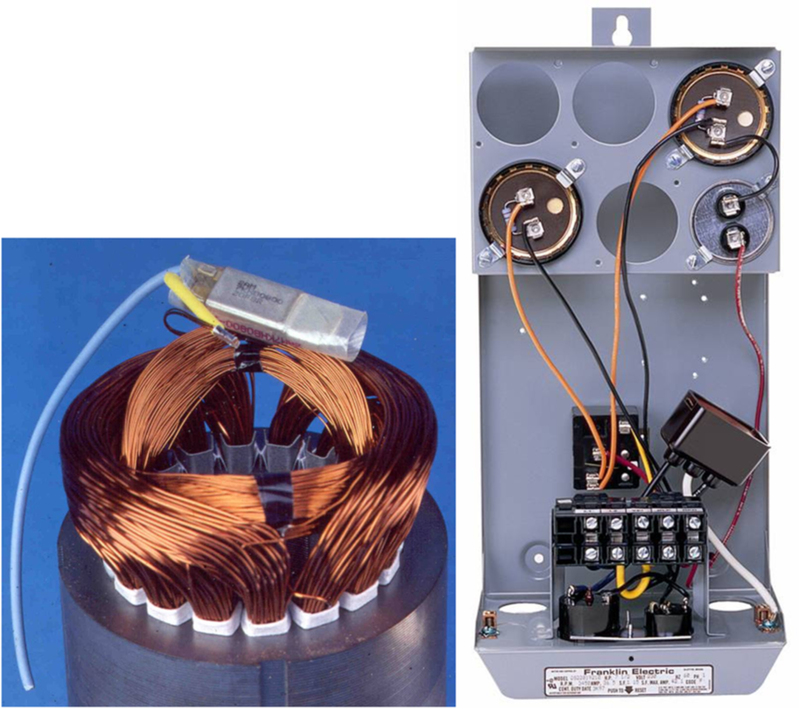 In the case of Franklin Electric single-phase submersible motors, Franklin Electric always supplies the overload, either in the motor itself or in the control box. With Franklin Electric 3-phase motors, however, a 3-phase panel is needed with the required overloads inside the panel. These overloads need to be specified and supplied by the installer or electrician. The most basic type of 3-phase overload is what’s called a heater. These are the oldest and most conventional. As current increases in the overload, the “heater” causes a bimetal contact to bend, thereby opening the circuit. Despite motor type, if you are working with a 3-phase system, all the work of picking the right overload is done for you on page 29 of the AIM Manual. Here, you will find the proper Class 10, Quick Trip overloads, both heater- and adjustable-type. Now that we have reviewed overloads and their functionality, we can look more deeply into what sets SubMonitor apart from typical overloads. Join us next week as we start a series on the SubMonitor and all that if offers in system protection. While Pumptec and its extended family are great options for protecting single-phase systems from adverse conditions, what kind of protection is offered for three-phase systems? This week’s Franklin AID will answer that very question. In our last post we discussed Pumptec and how it protects single-phase submersible systems from damage. The protection doesn’t stop there, however. Franklin offers two other members of the Pumptec family, specifically designed for Franklin single-phase motors. QD Pumptec is very much like Pumptec in functionality and how it works, but in a smaller, unique package that quickly installs in a QD Control Box. Using power factor to monitor Franklin 230V submersible motors from ½ to 1 horsepower, QD Pumptec protects against the same adverse conditions as the original: overload, underload, high and low voltage, and rapid cycling. This specific product is often thought of as mini Pumptec because it is designed exclusively to fit inside Franklin QD control boxes. Also offered in the Pumptec family is Pumptec-Plus. Sometimes called the “big brother,” Pumptec-Plus protects against those same five conditions, but it works with any 230 V single-phase motor ranging from ½ to 5 horsepower. Unlike its Pumptec companions, however, Pumptec-Plus monitors wattage rather than power factor. When watts run 25% higher or lower than operating load, Pumptec-Plus will remove power from the system. We can get a good idea of what our operating watts should be by turning to page 13 of our AIM Manual. Let’s say we are working with a ½ hp, 4-inch, three-wire motor. That motor should operate between a full load of 670 watts and a maximum load of 960 watts. Since actual running wattage varies by motor, each Pumptec-Plus needs to be calibrated at installation. This calibration allows the Pumptec-Plus to tailor its performance to each specific system so that it can be used with any ½ to 5 hp, single-phase, 230 V motor—even those not manufactured by Franklin. The system lights on the face of Pumptec-Plus are also an important feature; their color and state (steady vs. blinking) tell you exactly what’s going on with the system. Some installers actually keep a Pumptec-Plus with them as a diagnostic tool. If a problem turns out to be intermittent, they can install the Pumptec Plus and have the homeowner make note of what the lights are doing when the problem occurs. No matter what type of system you are installing, it’s important to protect your investment. Taking the time to look into protection options can save time and money for you, as well as your customer, in the long run. For more information about how to protect your investment in the field or for troubleshooting help, contact our Technical Service Hotline at 800.348.2420 or hotline@fele.com. Last week, we reviewed “drought insurance” for submersible water systems using the Pumptec family of products. This week, we will look specifically at Pumptec and how it protects a system from damage in many other ways. 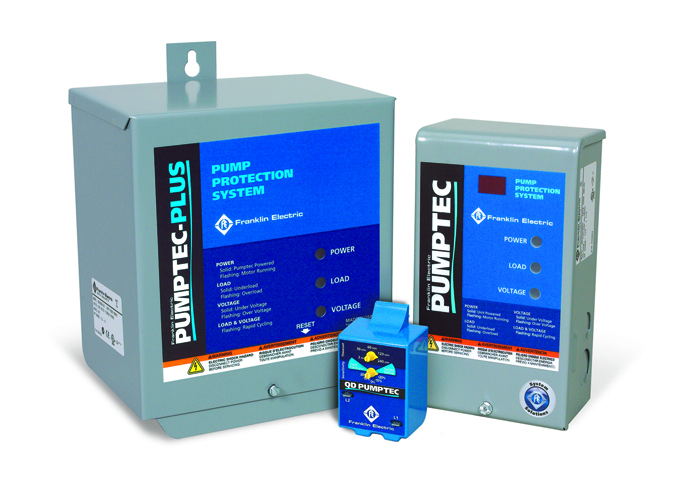 Pumptec is a microcomputer-based pump protection device that monitors load and supply voltage in single-phase systems. It protects against five conditions that can be dangerous to a motor: underload, overload, high voltage, low voltage, and rapid cycling. Underload, also known as dry well, includes any condition that leads to the motor becoming “unloaded”. Besides a dry well, this could be an air- or gas-locked pump, failed impellers, a line blockage, or a check valve that is stuck closed. Any of these will cause the motor to unload. Once the unloading reaches a predetermined threshold, Pumptec will remove power from the motor. Anytime an underload condition occurs, the load light will come on steady and stay on until the reset time is achieved. This reset time can be set from two minutes to four hours, or a manual reset can also be specified. Overload is the very opposite of underload and can occur when the pump becomes clogged with sand or other debris. If this happens, Pumptec will cut power to the motor and the LOAD light will flash. Unlike an underload, there’s no reset time for an overload condition. Pumptec assumes that it warrants investigation and probably won’t restart. The unit must be manually reset by cycling power to the unit. In both of these situations the system goes from pumping a normal amount of water to pumping very little or no water. To monitor these conditions, Pumptec uses a threshold point on the power factor curve. As we know from our previous AID, power factor is the relationship between voltage and current. Each motor rating has a unique power factor curve, and thus a unique trip point. If a motor experiences a loss of water for any reason, the power factor of the motor begins to drop rapidly. When it gets too low (i.e. reaches the threshold), Pumptec shuts off the motor and allows the well to recover. After a predetermined timeout, the system will come back on; however, if the load does not reach or exceed the needed power factor, the system will shut off again. If power factor gets too high, Pumptec will also shut off the motor, but in this case, a manual restart is required. 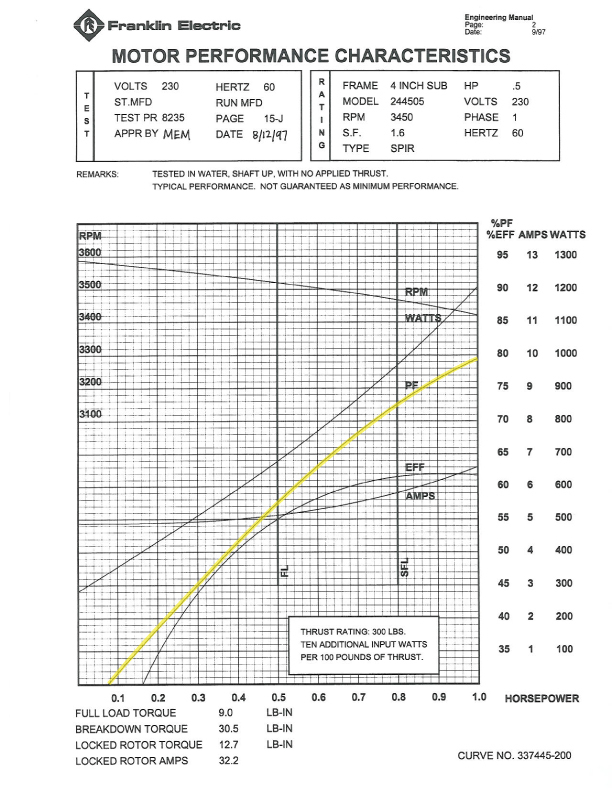 You can see how these power factor scenarios correlate to underload and overload conditions. As we mentioned earlier, Pumptec not only protects against underload and overload but several other damaging conditions. High or low voltage can create a multitude of problems for a motor electrically. That’s where Pumptec comes in: to monitor the installation’s supply voltage. If voltage drops below or exceeds 10% of the rated voltage (either 115 or 230 volts), Pumptec will automatically shut down the system. If the voltage is low, the voltage light will come on and remain steady; if the voltage is high the light will flash. Rapid cycling is the final condition monitored by Pumptec. Characterized by too many starts in a given period of time, it is most often caused by a failed pressure tank or switch. Because rapid cycling can cause serious damage to an entire system, when it is detected, Pumptec will remove power from the motor until it is manually reset. 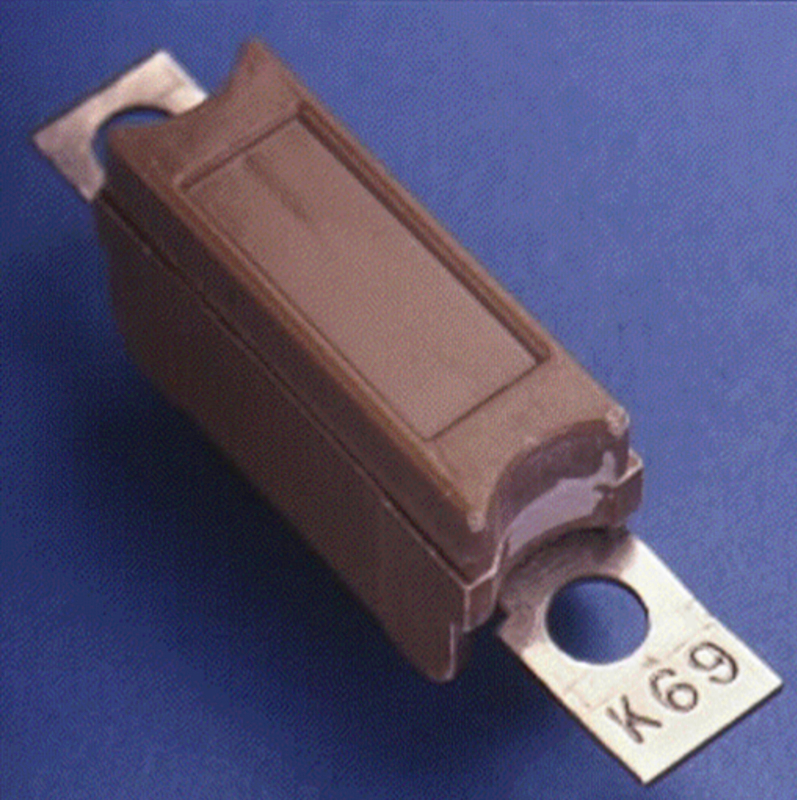 It is important to note that because Pumptec monitors power factor, which is a unique measurement for each motor design and rating, this protective device cannot work on just any motor. Pumptec is uniquely engineered and designed to work only with Franklin Electric submersible motors from 1/3 through 1.5 horsepower. For more information about Pumptec please visit our website and be sure to stay tuned for next week when we will continue to explore the Pumptec family of products. Franklin AID is Application-Installation-Data for groundwater professionals. Technical tips and product information come to you in electronic format. Looking for something specific? Use this box to search the site.